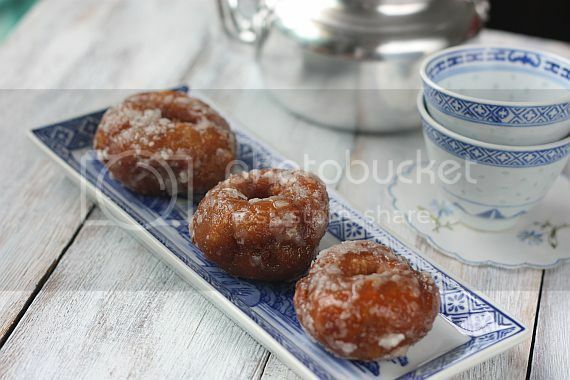 Kuih Keria or Sweet Potato Doughnuts is another all time Malaysian favourite tea-time snack. 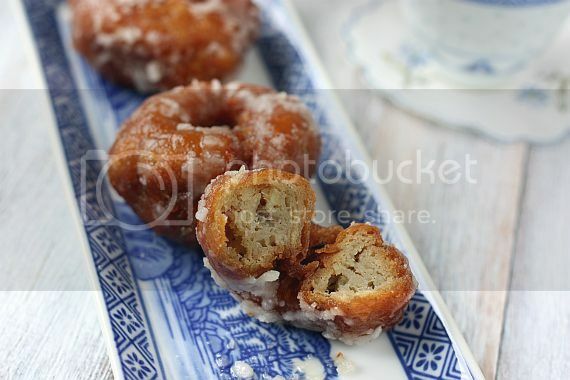 Unlike the other doughnuts which you may be more familiar with, Kuih Keria does not use yeast at all and as such there "rising" time associated with yeasted recipes is not required at all. Sweet potato is used in this snack and the proportion of it versus flour is more than triple. When I was a little girl (that's many decades ago), there was a street vendor who would peddle local snacks. He would have a long pole which he carried across the back of his shoulders and at the end of each pole was a covered basket. Inside the basket you will be able to find all sorts of goodies. As he walked up and down our neighbourhood, he would be yelling loudly "kuih, kuih" (cakes, cakes) to attract everyone's attention. How we loved peering into his basket to see what was the "catch of the day"! Those were the days when kuih was sold at 20 cents each. You can imagine the value of the dollar (well cents in this case) then. Now I can only get three pieces of kuih keria for $2.00. 1) Scrub sweet potatoes clean under running water. Place in a pan and cover with a generous amount of water. Boil until tender - test by inserting a skewer into the thickest part of the potato: it should go in without much resistance. Remove sweet potatoes from water and leave to cool. 2) When cool enough to handle, peel the skins. Mash sweet potatoes until free from lumps. Pick out any tough fibres and discard. 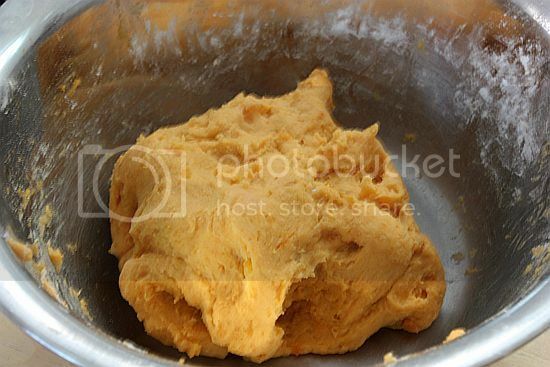 3) Sift flour, salt and baking powder together and add to mashed sweet potatoes, kneading lightly until smooth. 4) Break off small pieces of dough about the size of a lime (about 30g or 1 oz each) and roll into smooth balls, flouring your hands lightly to prevent the dough from sticking. Flatten the balls slightly and make a hole through the centre of each one with the floured handle of a wooden spoon. With your fingers, lightly pat the edges around the hole for a nice, smooth 'doughnut' finish. Repeat until dough is used up. 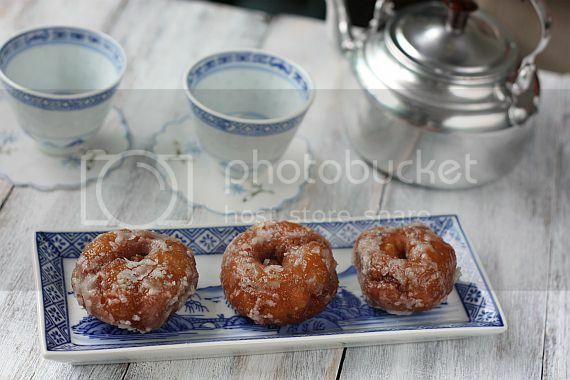 Lay the doughnuts on a lightly-floured tray. Cover the doughnuts with a cloth to prevent it from dyring out whilst you shape the rest. 5) Heat oil in a pan or wok over medium heat. The oil should be about 2 cm (1 in) deep. Keeping the heat on low, fry the doughnuts until golden brown on both sides, about 6 to 7 minutes. Drain on absorbent paper. 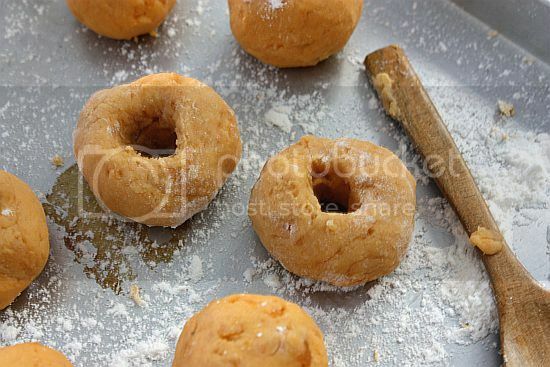 6) Traditionally, these doughnuts are rolled in cooked melted sugar until the sugar crystalizes around them. An easier, healthier way would be to simply roll them in caster sugar. Serve soon after making. Note: It is imperative that the temperature of the oil is kept low (the doughnuts should sizzle slightly upon contact with the oil). Frying doughnuts at too high a temperature will result in an unattractive, blistered appearance. Can we bake these instead of deep frying? Those doughnuts look so tempting!  Jo , this is one of my face! Love the crunchy sugar coating with the slight chewy kueh, yum! These sound so much healthier than regular donuts! I forgot what it is called...thanks for reminding me! kuih keria! I love this kuih alot! Hi Jo, you are so good in frying. I must learn from you. My fritter doesn't look as nice as yours :( hope to meet up with you again and please teach me ok? Oh man, that looks sooo good! I'm drooling over here! Hi Emily, I personally have not baked them before and do think that the whole texture will change completely. In fact I have never come across a baked version of this as well using the ingredients stated in this recipe. If you do decide to try it, I would be interested to know how they turn out.